By DONNA PARKER — Steven Spielberg is in talks to direct the screen version of the best-seller “The Bridges of Madison County” for Amblin Entertainment and Warner Bros., sources said Tuesday. Speilberg and former Amblin president Kathleen Kennedy are producing the Robert James Waller book about the love between photographer Robert Kincaid and Francesca Johnson. Insiders say Spielberg’s interest in photography was invigorated following work on the black-and-white “Schindler’s List,” and that after taking a “brief respite” from directing he’ll return to direct something more upbeat. Set in Poland, “Schindler’s List” tells the story of a businessman’s fight to save thousands of potential Holocaust victims. Spielberg and crew spent four months in Poland for “Schindler’s List,” prompting the decision to take a rest. Although “The Bridges of Madison County” was adapted by “Rain Man” screenwriter Ron Bass, and a Kurt Luedtke (“Out of Africa”) draft is due, insiders say the final script is a long way off. “The Bridges of Madison County,” has been on most best-seller lists for 52 weeks. it is No. 1 on the New York Times best-seller list. Set in Iowa, “The Bridges of Madison County” tells the love story of National Geographic photographer Kincaid and Johnson, who meet by chance when he stops at her Iowa farm to ask directions. Spielberg also directed “Always,” starring Holly Hunter and Richard Dreyfuss. It is not known if Robert Redford will portray Kincaid in the film although his name had been previously attached when Sydney Pollack was on board. Spielberg’s name had been mentioned as director on the high-profile project after Pollack dropped off the picture a few weeks ago. His agency representative declined comment. 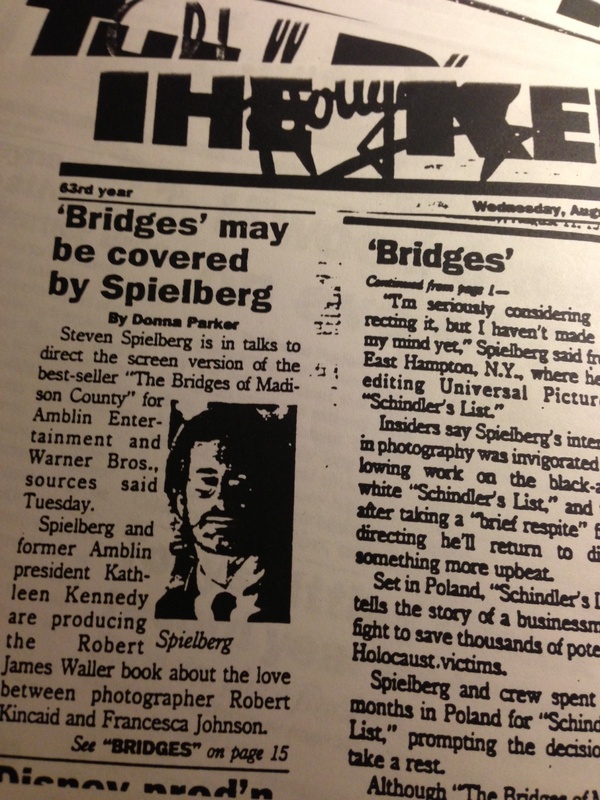 Editor’s note: While Clint Eastwood went on to star in, direct and produce (with Kathleen Kennedy) “Bridges,” this 1993 story was cited in The Wall Street Journal as an example of how The Hollywood Reporter was giving the competition a run for its money on breaking news. I was pleased and surprised Steven was so refreshingly honest with me. This entry was posted on February 21, 2013 by News in Clint Eastwood, Donna Balancia, Spielberg movies, Steven Spielberg, Unforgiven and tagged Bridges of Madison County, Donna Balancia, Donna Parker Balancia, Kathleen Kennedy, Steven Spielberg, Wall Street Journal, Warner Bros..